Asthma is the result of inflammation and constriction of the bronchial tubes. Allergens, environmental irritants and even stress can cause symptoms of asthma. If untreated, asthma can start with mild symptoms such as a cough or wheezing, and then escalate into an asthma attack. Severe asthma attacks make it very hard or even impossible for the asthma sufferer to breathe, depriving him of oxygen. Although there is no cure for asthma, there are steps you can take to treat or eliminate symptoms. Use an inhaled medication. 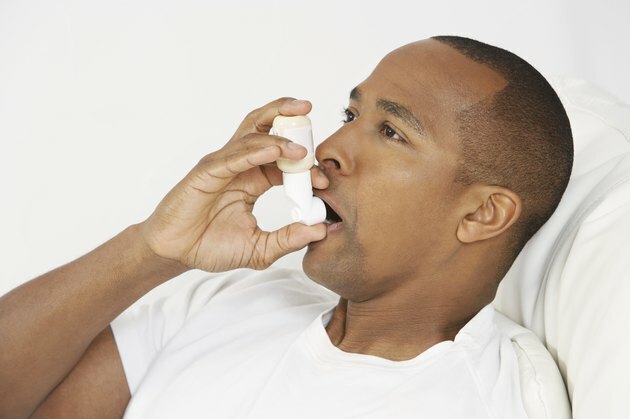 Albuterol is a short-acting beta-2 agonist that temporarily relaxes airway muscles to help you control your breathing. Atrovent is an inhaled anticholinergic that can help to provide immediate relief. Atrovent works similarly to albuterol. Albuterol is used as a quick treatment for acute symptoms. Chronic symptoms are usually treated with a Flovent Diskus, which must be prescribed by your doctor. Take an oral prescription medication such as Theophylline. Theophylline is taken daily and is used as a long-term treatment to suppress asthma symptoms. Theophylline relaxes the muscles around airways, making it easier to breathe. Prednisone is a prescription medication is also used for long-term treatment to treat more severe asthma symptoms. Prednisone is only taken when needed. Exercise and maintain a healthy weight. Exercising daily not only helps to keep your weight down, it also strengthens your lungs. Strengthening your lungs reduces the pressure they feel when it's difficult for you to breathe. Exercising doesn't necessarily mean working out at a gym. Try taking a walk during your lunch break. Aim for 15 to 20 minutes of continuous, moderate activity per day. Eating healthy foods such as fruits and vegetables allow your body to use the food you eat as energy helping you to maintain a healthier weight. Use an air conditioner to reduce humidity and cleanse inside air. Clean the filters in your air conditioner and furnace regularly. Keeping the air in your home or office clean reduces the presence of allergens and can prevent coughs. Wear a face mask or cover your mouth with a clean scarf if cold, dry air aggravates your asthma. Control your stress and remain calm. Asthma can produce bouts of coughing lasting for a few seconds up to several minutes. Because these coughs can cause an attack, it is common for an asthma sufferer to become anxious or fearful. Breathe deeply or drink some water to calm the cough. Learning breathing exercises is a proactive way to learn how to calm yourself down when you become stressed. Drink water regularly to keep the bronchial tubes moist.